How do I estimate my ring size? We suggest visiting a local jewelry store to get your finger sized accurately. Please inform the jeweler the approximate width of your ring. A person can wear up to half to one size larger for a wider band. Alternatively, you can follow the procedure below to obtain your ring size. 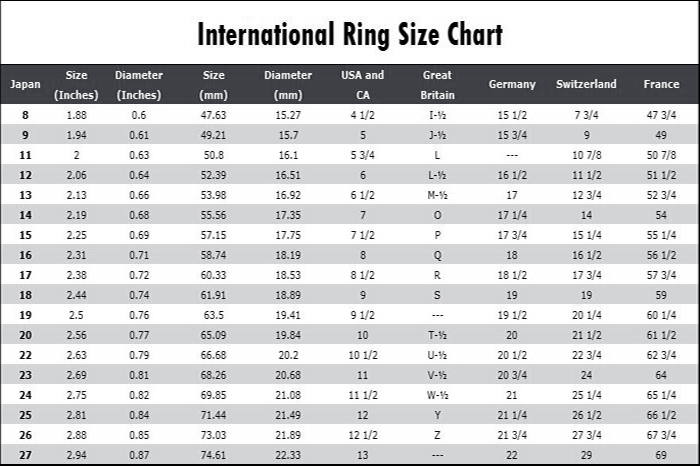 Sizes are expressed in American Ring Sizes. The ideal size will fit comfortably and be tight enough to prevent the ring from accidentally falling off. Before ordering make sure that the ring size is correct. Finger size changes with temperature and time of day. The best time to measure accurately is midday. Step 1: Get a piece of twistie or strip of paper. Step 2: Wrap it around the base of the appropriate finger. Step 3: Mark the point on the string or twist the twistie to tighten up the loop, forming a complete circle. Step 4: Measure the length from the starting end of the string/twistie to the pen mark.